My decorating began with a new piece I acquired from a cute repurposing shop that was closing. 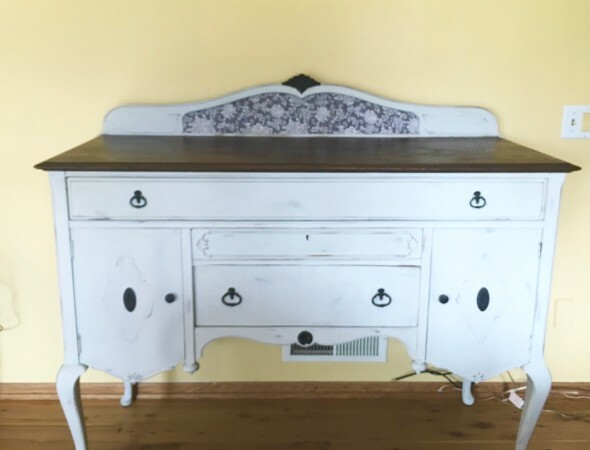 Typically, I do not buy a piece that is completely finished, but this buffet was priced to move. You know me, an awesome deal does not get past me too often  So this piece became my focal point. I added an old perfectly chippy window from my stash, to the wall behind the buffet. I felt it just needed a little something -something to dress it up bit. I think a pink wreath would do the trick. I love pink. It makes me smile. Some thrifty accessories added to the top, and the look is complete. 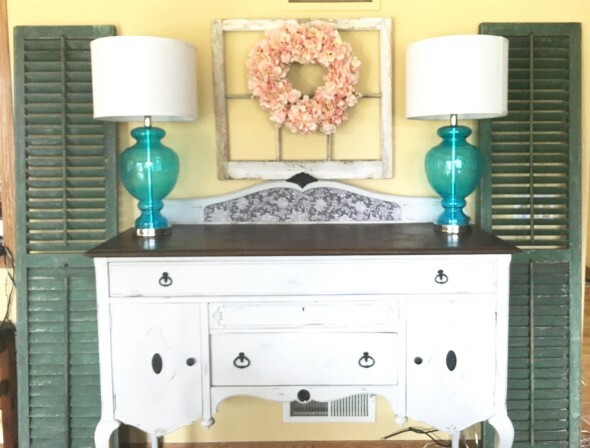 Thrifty Spring Decorating…. check! Well, maybe I’ll do a bit more change-ups. I just can’t stop!! Shopping my home is one of my favorite decorating tips, too! 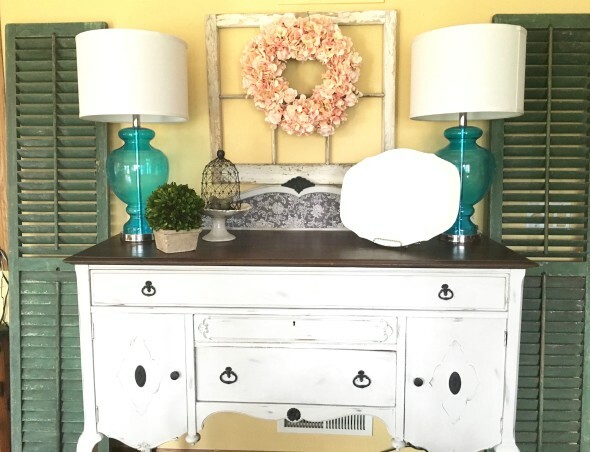 I really love how you’ve combined what you have for a fresh look ~ Thank you for sharing @Vintage Charm–pinning to our Features & Favorites! Wow, you amaze me how you put it all together like that. It must give you a lot of pleasure to express your creativity. Wow. Love the step by step photos. What an awesome find, that buffet was a must have! You will have so much fun throughout the seasons decorating it with your skills. Now I just don’t know how in the world I’m getting by without a set of chippy shutters and a chippy window frame! Your decorating talent is always impressive. I’m in love with that buffet and the way you decorated it. Will you please come to my house and decorate my buffet? 🙂 I have the lamps and a photo collage behind it. My tabletop decor needs some inspiration. Thanks for sharing yours. 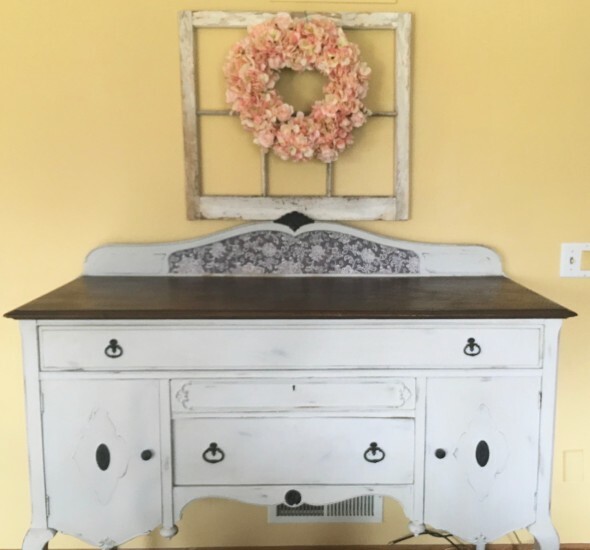 You can take any piece and make it look refreshed and absolutely beautiful! Love this! I’ve been searching for a “chippy window” around my town without any luck! I love the colors you chose! Beautiful! Great style. I love going thrift shopping and changing out my decor often also. So much fun! Oh Mary! I love that buffet! The way you updated it is aweome! Congratulations on finding that piece. Thank you for sharing at #OvertheMoon. Pinned and shared.